The temple is located near Vaideeswaran Koil. 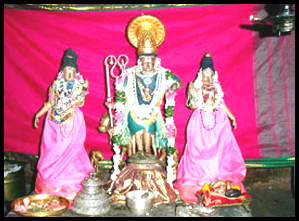 The Moolavar is Gopaalakrishnan (Raaja Gopaalan) seen in standing posture with Rukmini & Sathyabaamaa facing east. The avadhaara sthalam of Thirumangaialwar is near this place. The Lord from this temple on Garuda Vahanam will also be a part of the Garuda Sevai festival in Thirunangoor (the day after Thai Amavasai). Thaayaar - Madavaral Mangai, Sengamala Naachiyaar (no separate sannadhi). Here Lord Gopala Krishnan give dharsan along with his wives Rukmani and Satyabhama. Vishwaksenar the chief of the Nithyasuri's was the son of Kundalai and Lord Varuna (Rain god). Kundalai was sent to disturb the penance of Saint Dhuruvasa by Lord Indra was gained his curse. So, she was born as a hunter's daughter and married pathiran a hunter. One day Lord Varuna loved her and as a result she bore Vishwaksenar as her child. Later by his hard penance he was made the chief of Nithyasuri's the good spirit's who live in Pramapatha and who are always near Lord Narayana. He wished to have dharsan of Lord Narayana as Lord Krishna and fulfilled his wish here. Rudran was caught by Brahma Hathi dhosam, an evil spell as he killed Lord Brahma. To over come this he prayed the Lord at Kadamba kshetram, Kantiyur and here at this place got rid of his problem. To gain the love of god, its enough if we do our duties correctly. Vishwaksenar and Rudran both were fully satisfied before having dharsan of this Lord and did not requested him anything. So Lord gave his blessing happily as he had said in Bhagavat git that if you do your duties without expecting anything from me, I would give all the necessary for you without your request. Access to the temple About 2 miles south of Thirunagari. The Moolavar is Sri Gopala Krishnan. Also known as Rajagopalan. He is giving his seva Nindra (Standing) Thirukkolam facing his thirumugham towards east direction. Prathyaksham for Vishwaksenar (Senai Thalaivar) and Rudran. This temple lies in the Tanjore district of Tamil Nadu. It's about 7 kms east from Seerkazhi and 5 kms away from the Vaihteeswaran Kovil railway station. Bus facilities are provided but staying facility are not provided.